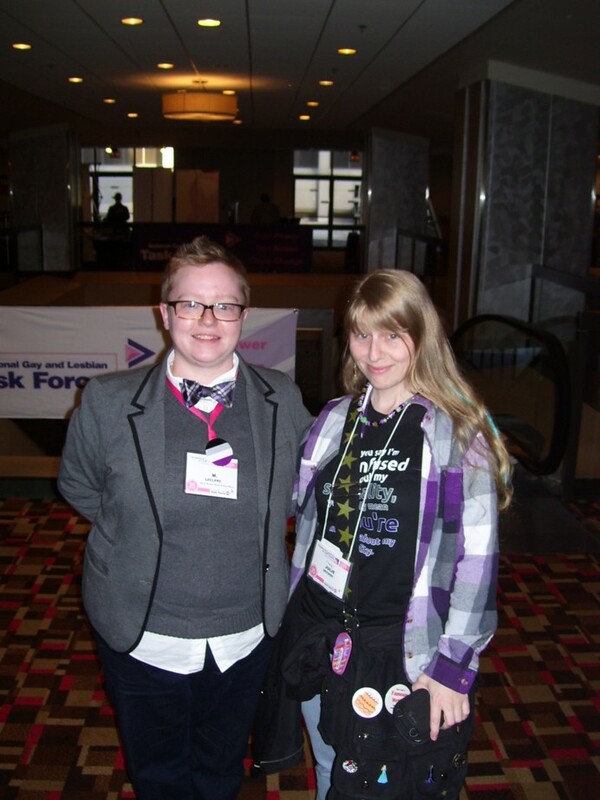 I went to Creating Change 2013 in Atlanta with the asexual contingent and spoke on a panel called Asexual Voices. We got to engage with the LGBT community and discuss asexuality in a welcoming atmosphere, and I met great people, did some awesome networking, and got to hang out with other aces! 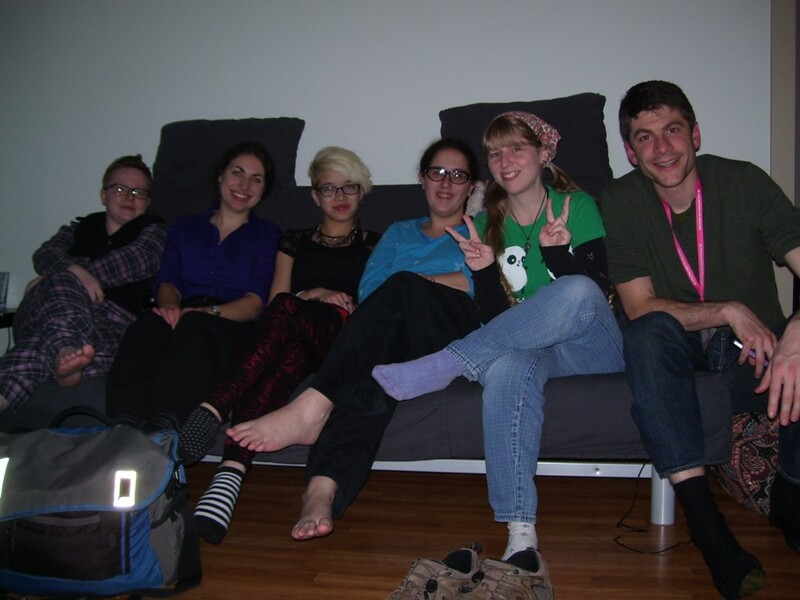 When I arrived in Atlanta and finally got into the apartment, we took a group picture. This is our whole contingent except Tristan, who was even later than I was. 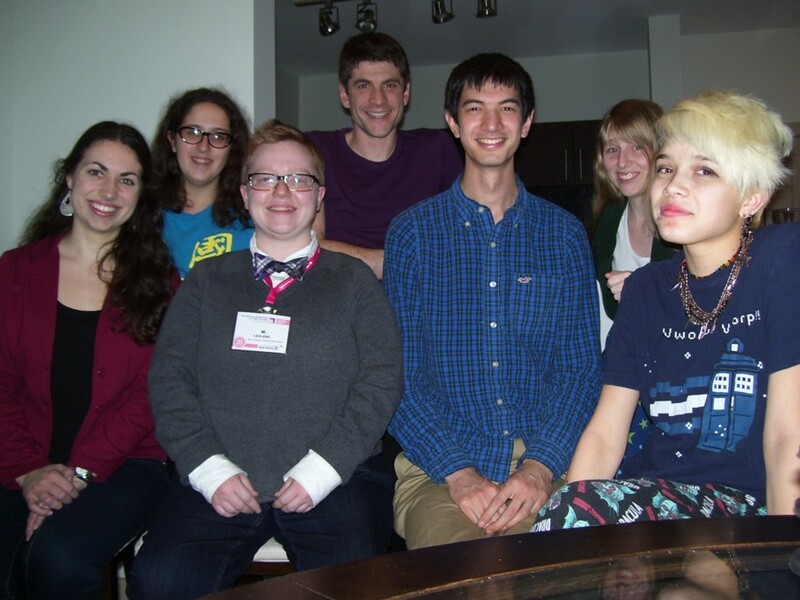 Meet M., Hannah, Rin, Sara Beth, me, and David. 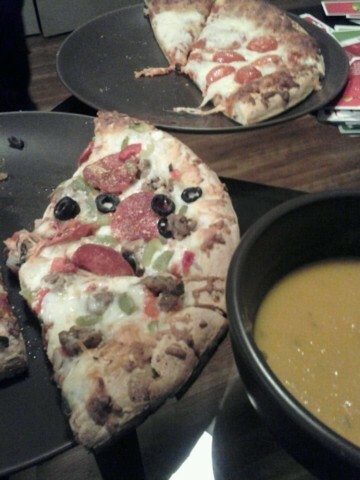 We took a late-night walk down to the store to get some grub, and ended up getting pizza and soup. 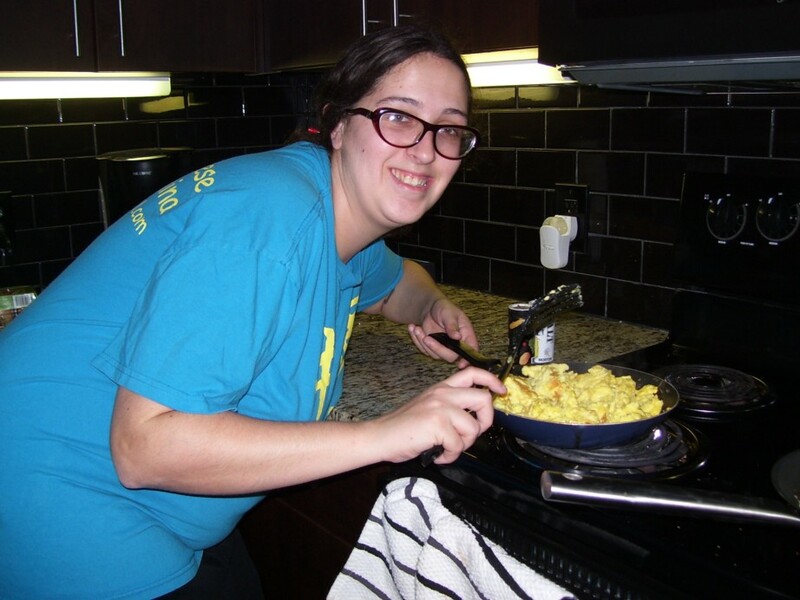 In the morning, Sara Beth and I made eggs and pancakes for everyone. 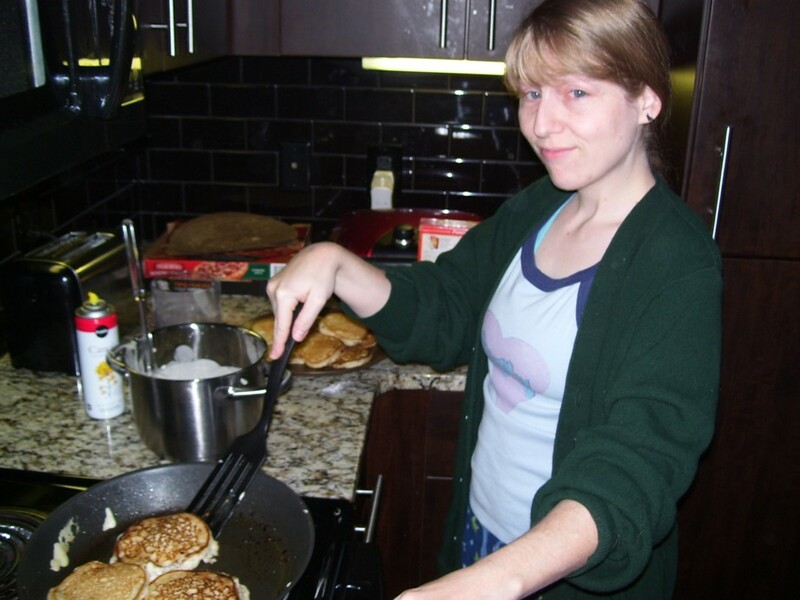 Here she is scrambling. Here are the aces about to have breakfast. Rin, Hannah, and M. are in this shot. 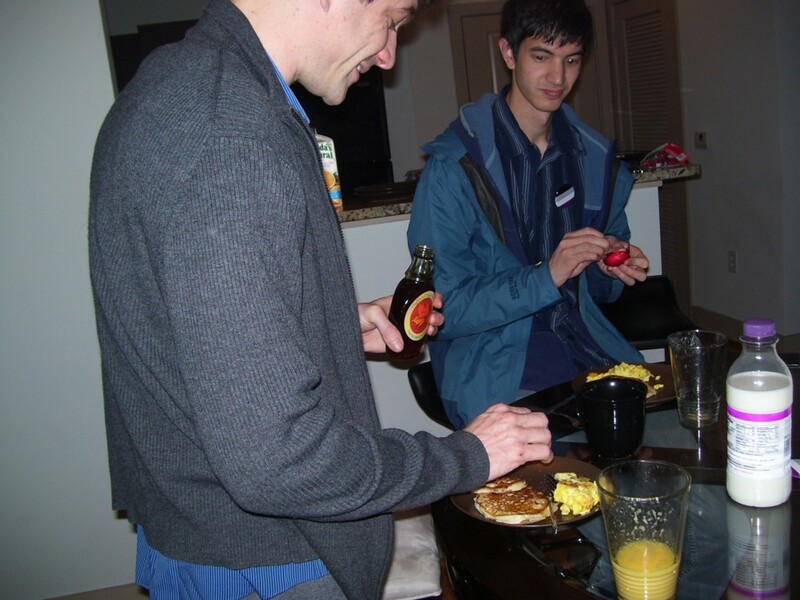 And here are David and Tristan. 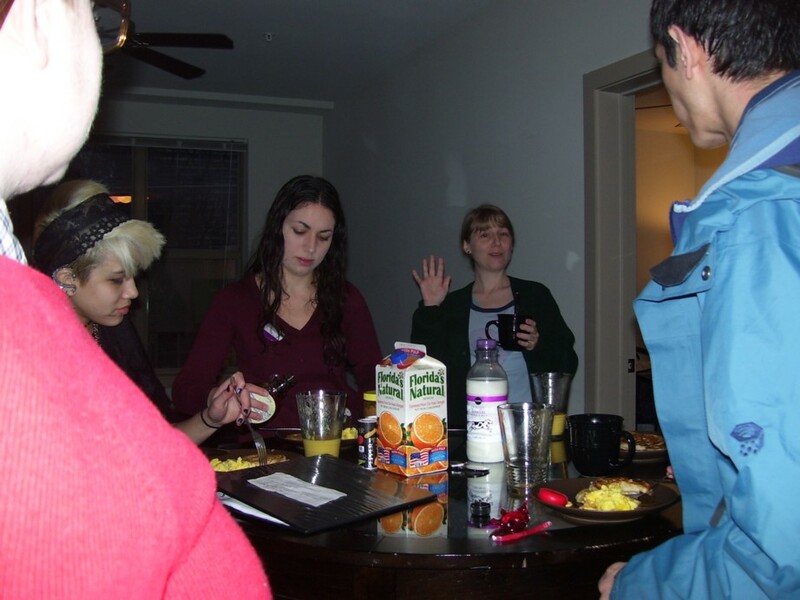 Ace breakfast: Rin, Hannah, and me, with M. and Tristan from the back. And here's everyone trying to decide what they're going to do at the conference when there was so much to choose from. 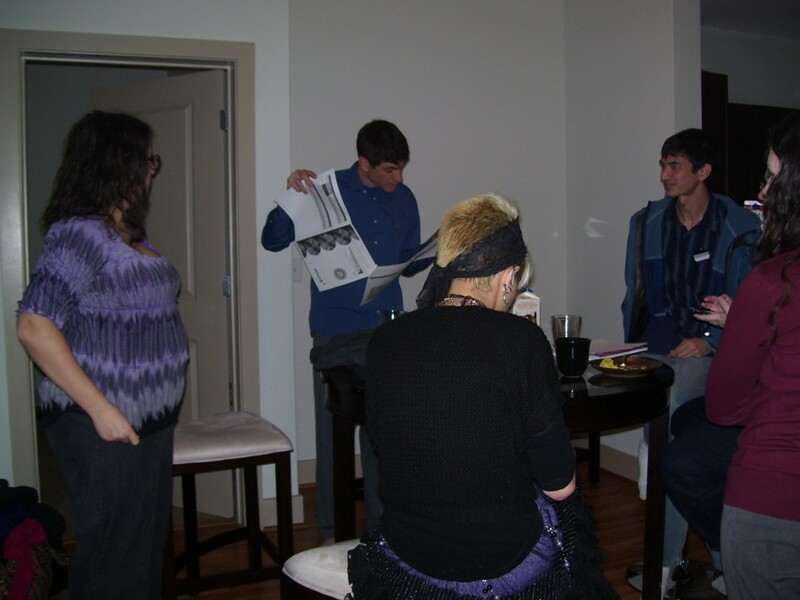 Here you can see Sara Beth, David, and Tristan facing the camera, plus Rin and Hannah from the back. 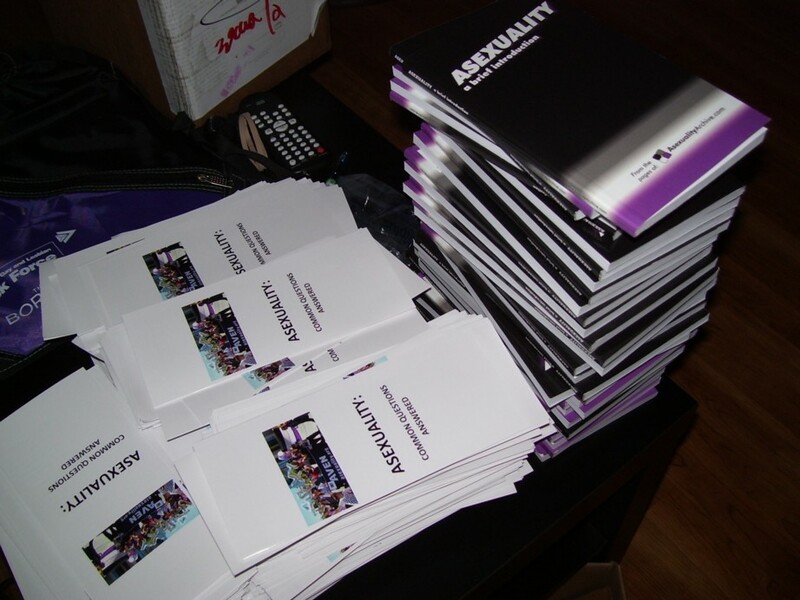 This is the stack of pamphlets and asexuality books we had to give out to interested parties to educate them about asexuality at the conference. This is the sign showing people what would be happening in that room at what time. 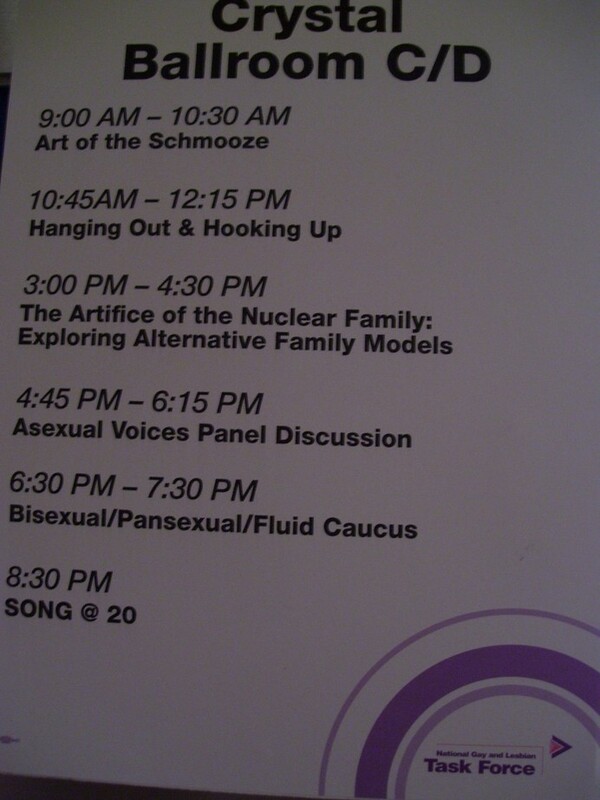 Our Asexual Voices Panel Discussion is on there! 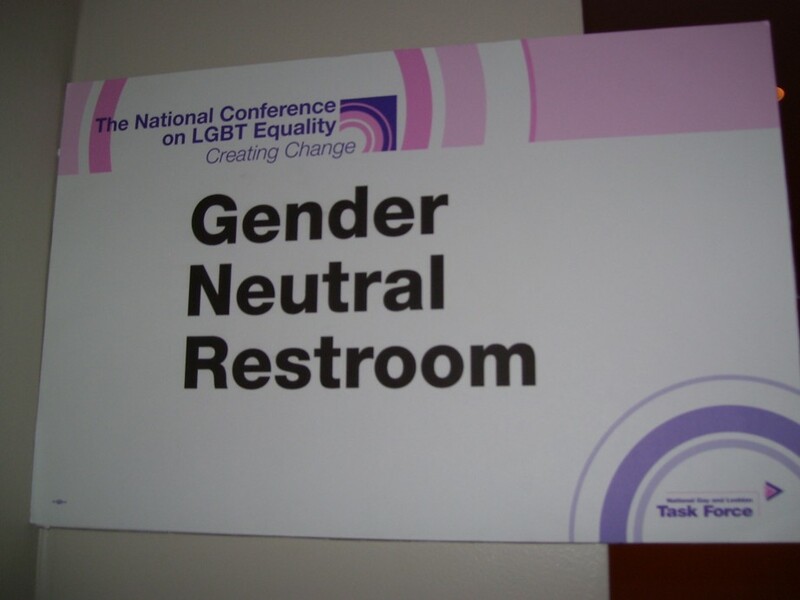 I thought it was a fantastic idea for this conference to have gender neutral bathrooms, so I photographed it. 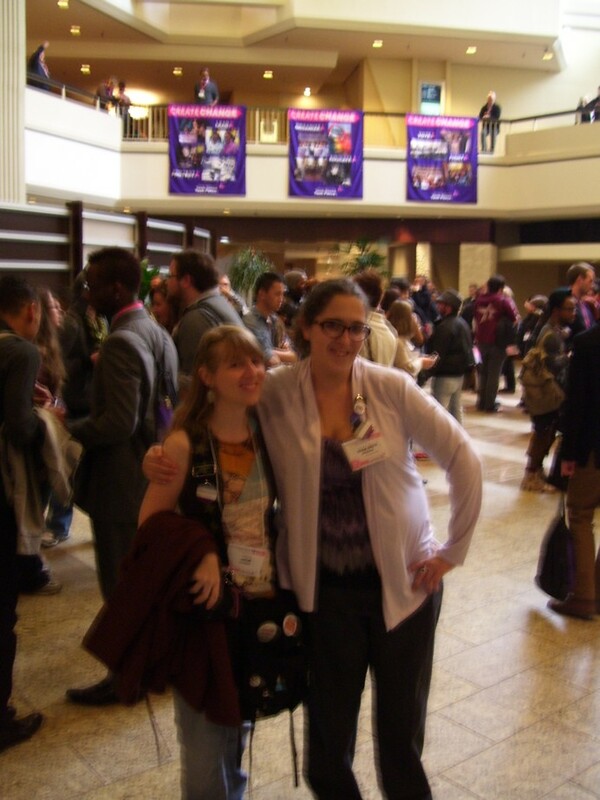 I spent most of the first day hanging out with Sara Beth meeting people, giving out pamphlets and making contacts, and checking out the conference. Here's us in the conference space. This is at our panel, where David is opening the cake we'd be eating during the caucus. Here's the ace panel. I'm giving my speech here. 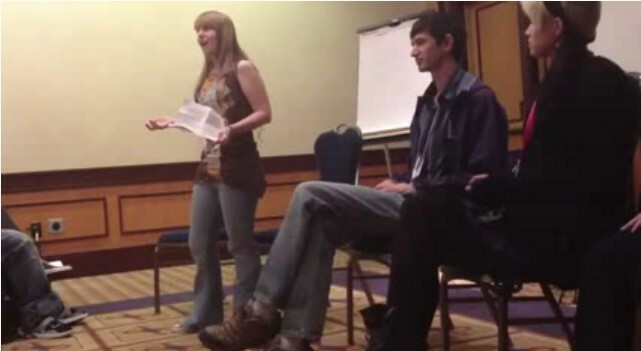 A photo of us taking questions during the ace panel. Here's the panelists still answering questions. 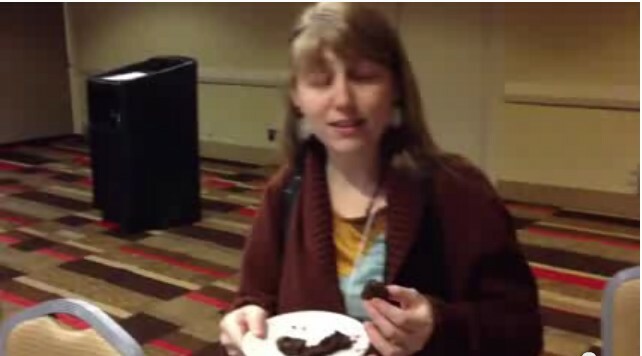 Here I am having cake at the ace caucus after the panel. 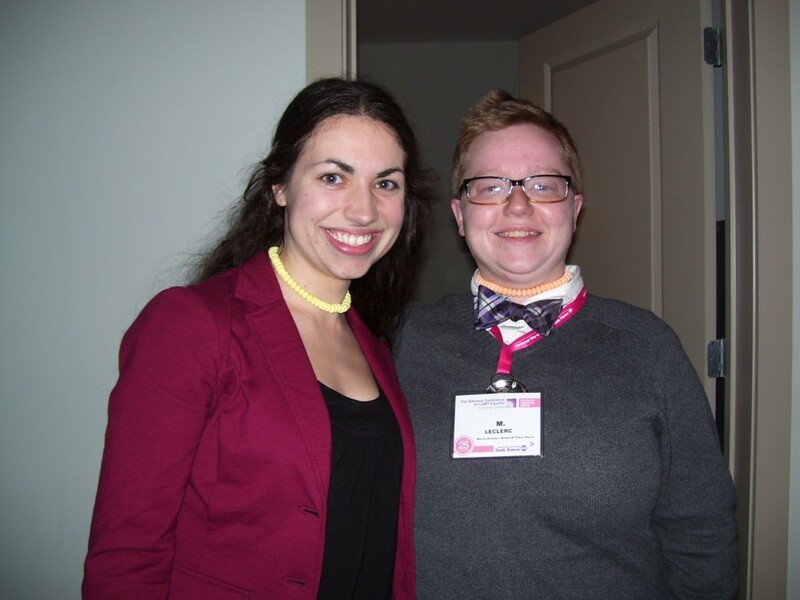 I spent most of the next day going to panels with M. and Tristan--here's me and M. rocking the asexual colors. 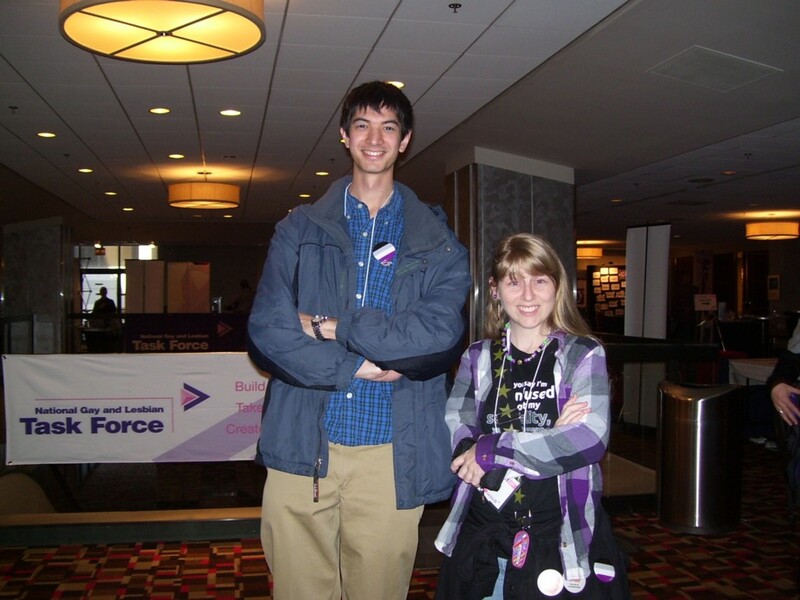 It's Tristan and Ivy--Tallest ace, smallest ace! 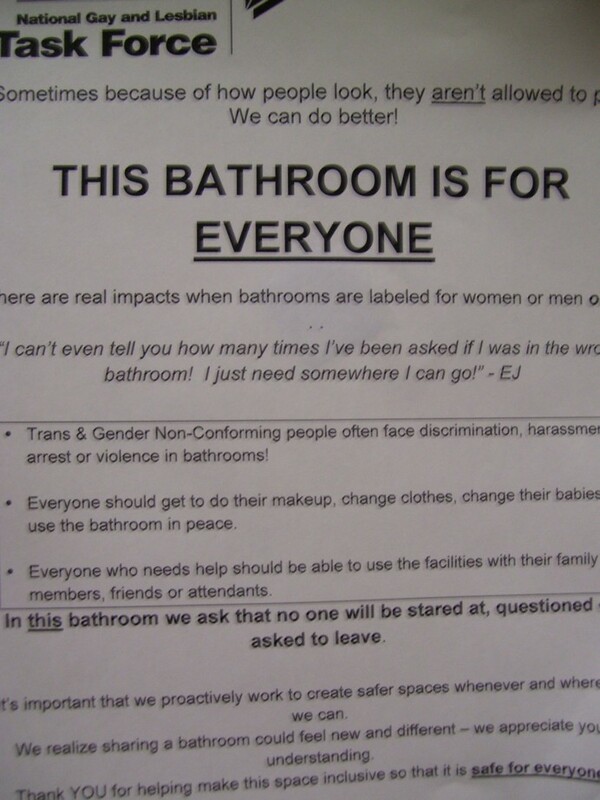 Here is the sign explaining the rules in the gender-neutral bathroom. Protip: Don't harass people or stare at them or make them feel like they're in the wrong place! 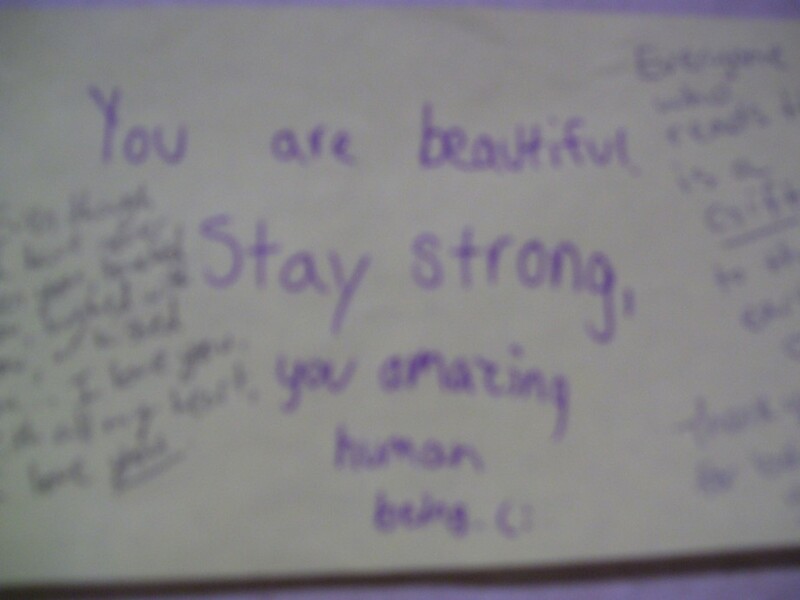 I saw this note written in the bathroom and I thought it was neat. 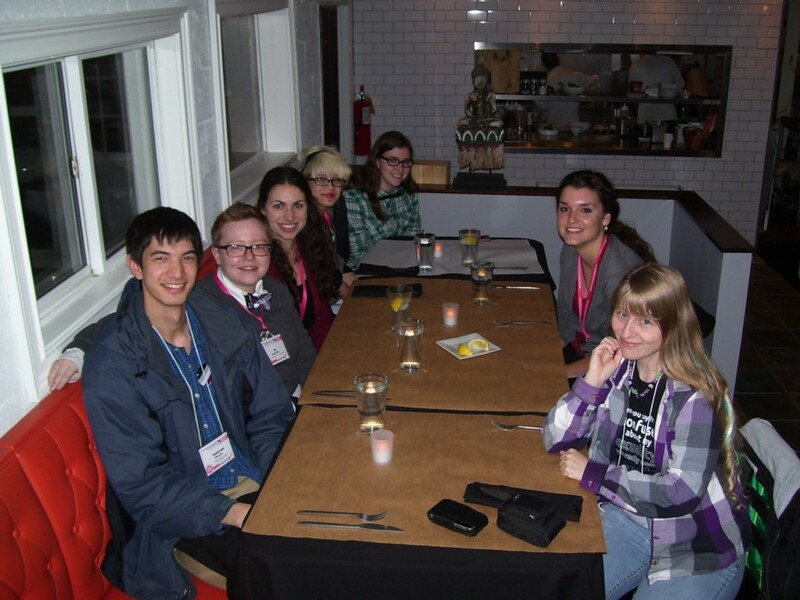 We went out to dinner with a couple other aces we met at the conference--Alicia and Halee. 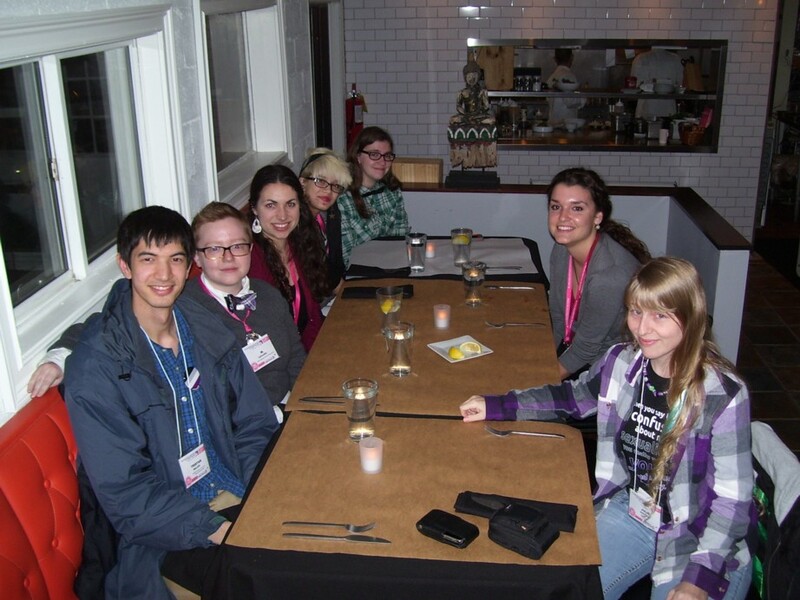 This is our group picture at a Thai place. 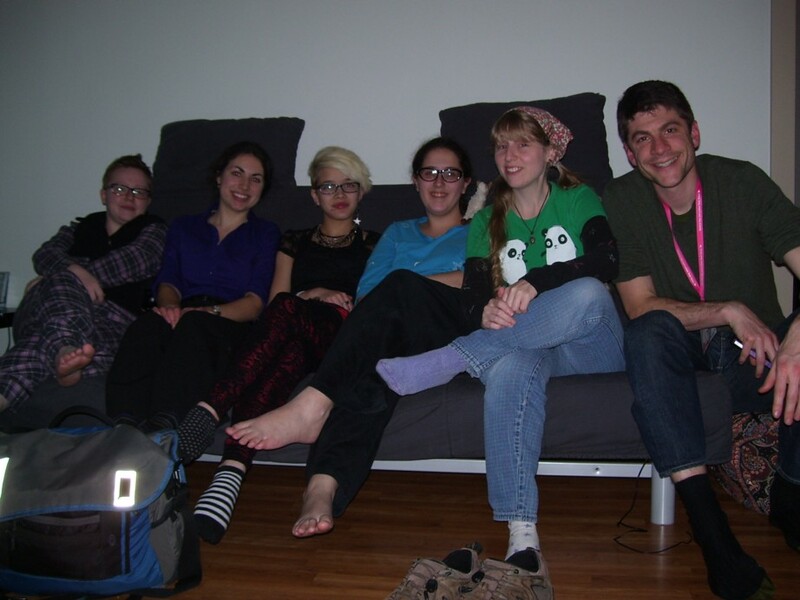 This is our first attempted group picture--but I figured out just before the flash went off that I was too short to climb up into the chair in time! By the time I finally got in the seat, everyone was laughing. We tried it again and this time we look a little more composed. 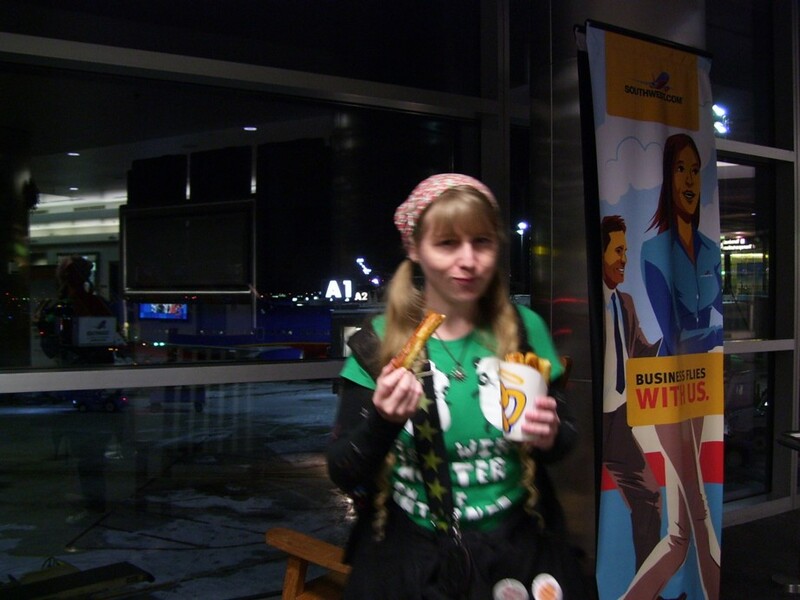 Then I gave out candy necklaces to everyone. This is David and Rin wearing them. 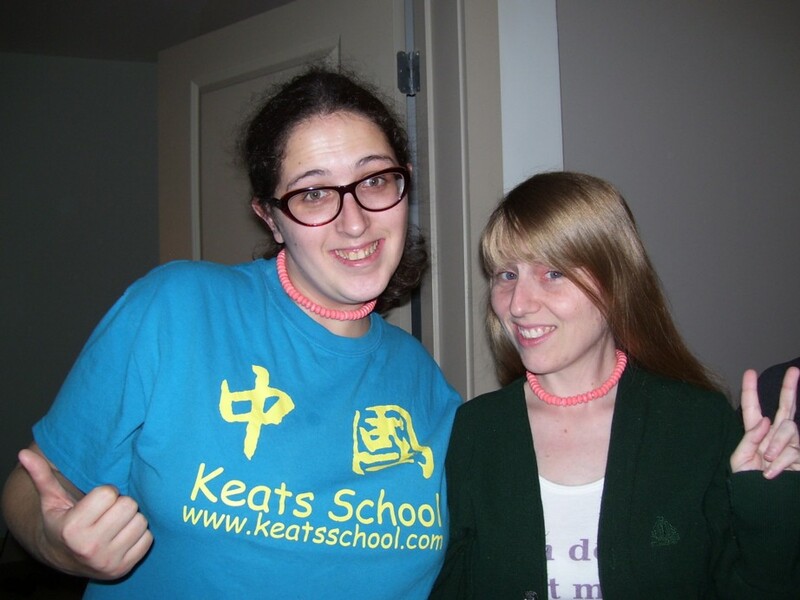 Hannah and M. wearing their candy necklaces. 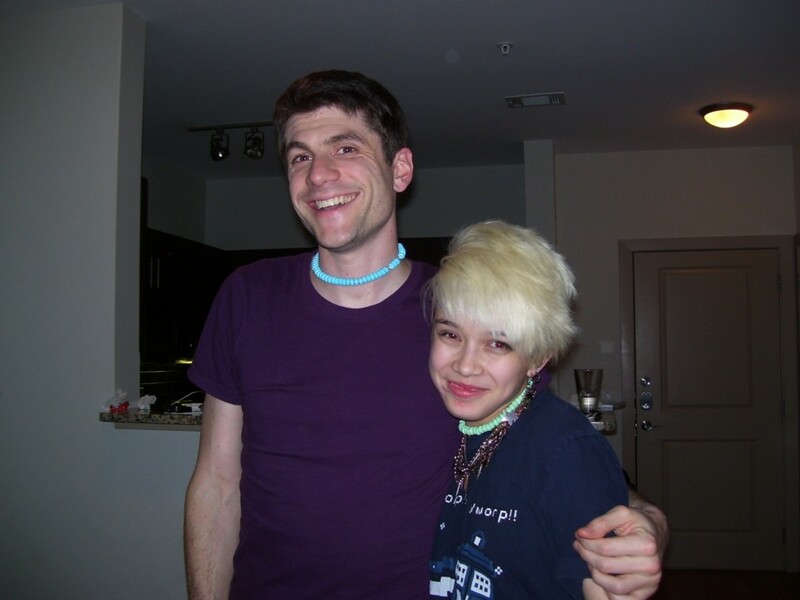 And this is Sara Beth and me wearing the necklaces. 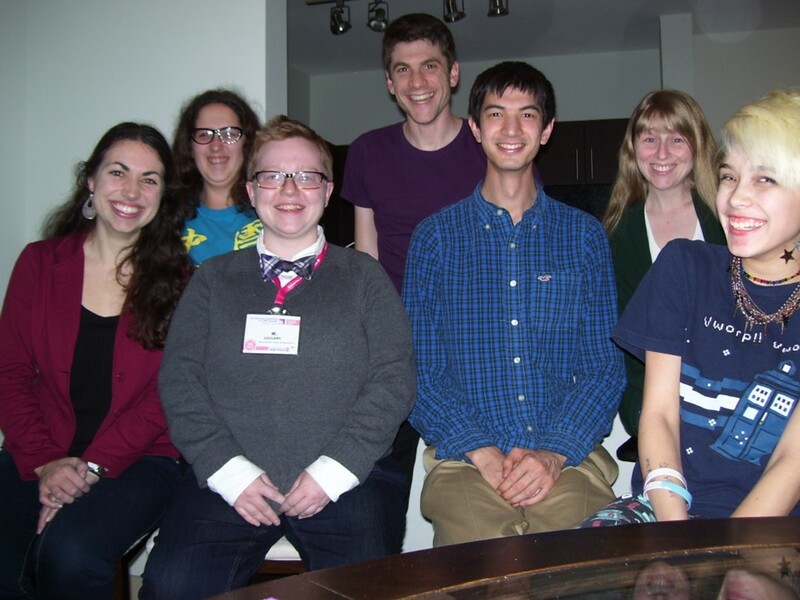 I flew back to Florida the next day and returned to my life, but I hope I'll see my ace friends again soon!